December 17, 2017 (Sunday), 9 am to 2 pm. July 2, 2017 (Sunday), 9 am to 2 pm. November 13, 2016 (Sunday), 9 am to 2 pm. Author signing. La Jolla Farmer’s Market, 7335 Girard Avenue, La Jolla, California. November 11, 2016 (Friday), 11 am to 3 pm. Author signing. San Diego Freedom Festival, Downtown San Diego at the Tuna Harbor Pier (directly in front of the USS Midway), San Diego, California. November 9, 2016 (Wednesday), 7:00 pm. Multimedia presentation. 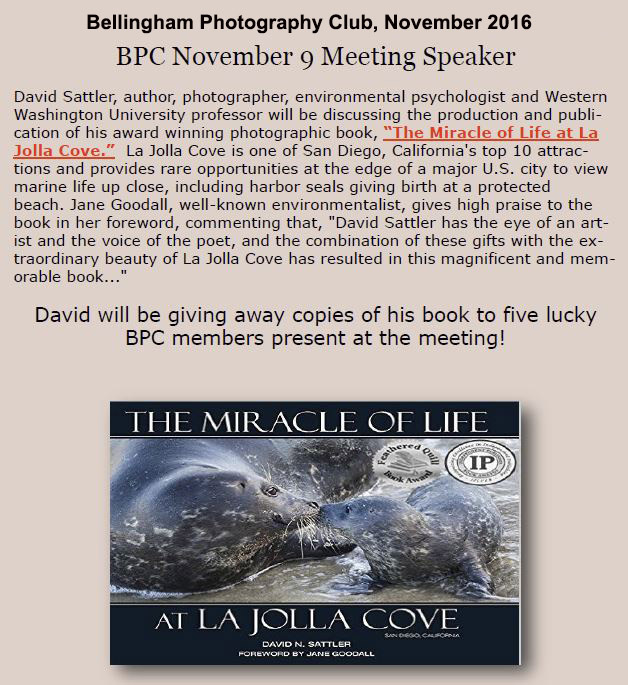 David will show images from “The Miracle of Life at La Jolla Cove” and share stories behind the photos. Bellingham Photography Club, 2309 Meridian Street, Bellingham, Washington. San Diego Festival of the Arts, Waterfront Park, Downtown San Diego (across from the Star of India). February 18, 2016, 4:00 pm to 5:00 pm. Free. Open to the public. Multimedia presentation. 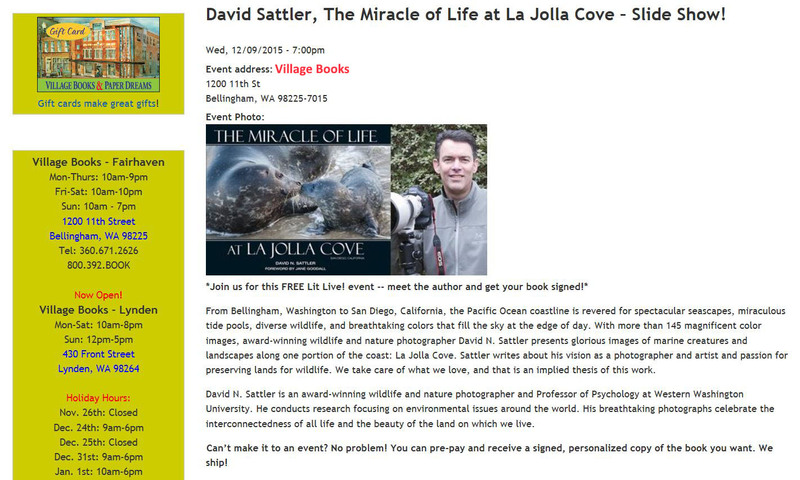 David will show images from “The Miracle of Life at La Jolla Cove” and share stories behind the photos. Western Washington University Library, Special Collections Room, Bellingham, Washington. December 5, 2015, 2:30 pm to 3:30 pm (Saturday). Multimedia presentation. 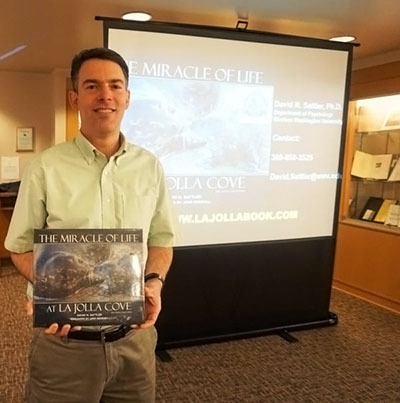 David will show images from “The Miracle of Life at La Jolla Cove” and share stories behind the photos. La Jolla Riford Library, 7555 Draper Avenue, La Jolla, California. Author signing and multimedia presentation. 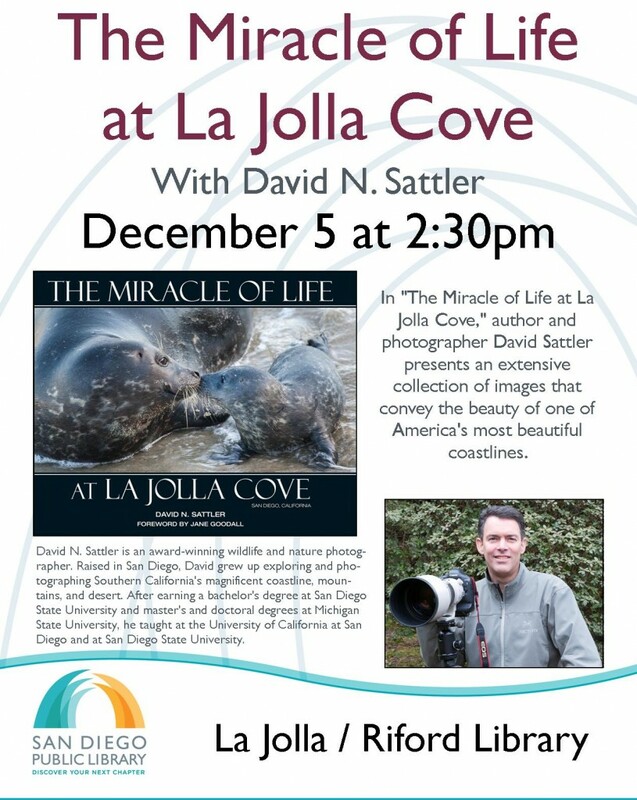 David will show images from “The Miracle of Life at La Jolla Cove” and share stories behind the photos. Village Books, 1200 11th Street, Bellingham, Washington. This award-winning coffee table book is the perfect special unique gift for you are your loved ones and friends, and makes a wonderful client appreciation gift! It will bring years of enjoyment!